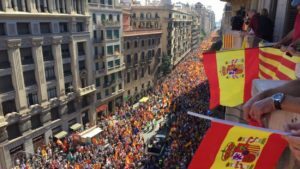 After a long silence, Algeria has finally reacted to the standoff between Madrid and the Catalan separatists, voicing timidly its commitment to “the integrity and unity of the Kingdom of Spain”. This hesitation reflects the uneasiness in which Algiers and the Polisario find themselves, and evidences that their so-called defense of the principle of self-determination is a mere sham. Algeria’s position, which implies that what is valid for the Polisario separatists in the Sahara is not valid for Carles Puigdemont’s friends, points to its concern not to fall in an inextricable diplomatic imbroglio. By evading to support the independence of Catalonia, Algeria and the Polisario seek to avoid the wrath of Madrid, although this support fails clearly their so-called “unshakable” support to the principle of self-determination. Algeria also seeks to avoid being in a very awkward position if it adopts a stand contrary to that of the international community. Actually, no country has supported the separatists of Catalonia and Algiers has carefully avoided going it alone in this matter, contrary to its position on the Sahara issue and its support for the Polisario and its separatist theses. In this Catalan crisis that held Europe and the whole world in suspense, Algeria waited to see in which direction the wind was going to turn before expressing itself. On the contrary, Morocco, from the outset, recalled that it is itself faced by a separatist threat and that it did not recognize and did not intend to recognize the unilateral declaration of independence of Catalonia.